As a mom of four children, and two grandchildren, I sure do appreciate durable products. Reviewing this Kraken A.M.S. 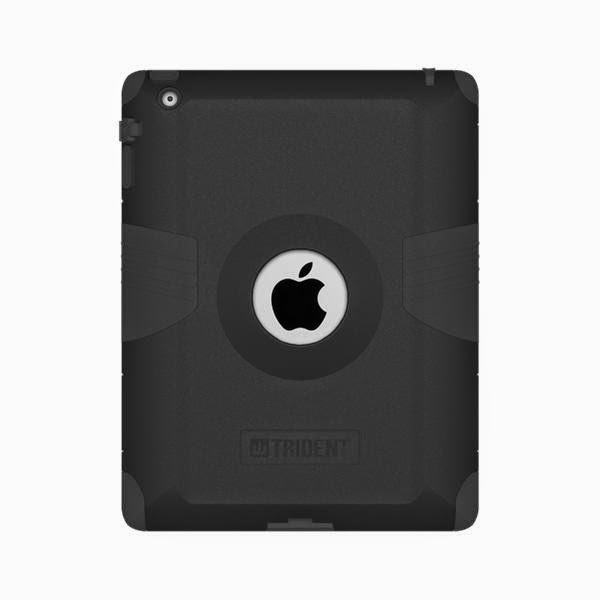 for iPad 2/3/4 from Trident Case has been a really easy fit for our home. We were excited to be offered to review this product! We were selected to review the iPad2 case in pink/black. My daughter (age 10) had no trouble figuring out how to install her iPad 2 in the case, but I would have loved to seen a few more detailed instructions on how to best install it (or just have your child do it for you). Once installed, I took note of all the connections and the coverings for each. I love, LOVE the dust coverings on all the portals, as dust in those portals is one of the main reasons they start failing to connect well to charging cords or headphones. Aesthetically, I really like the look of the case. My daughter loved the color combinations, and was very excited that this case from Trident Case included a cover for the front of her iPad. We have been using store-bought peel off sticky covers, so this was a huge improvement, and the responsiveness of the touch screen was NOT diminished at all. On the second day after installation, our wild two-year-old grandson came over, and as usual, went straight for Abbey’s iPad. As he went to grab it, he didn’t get a good hold and dropped the iPad right on the concrete floor. We all gasped, and then relaxed as we realized the Kraken A.M.S. case had completely protected it from any damage. Since adding this case to our iPad2, I feel much more confident to allow my daughter to take the iPad out of the house to her playdates. Before, I was too nervous about damage to it and wouldn't allow it. It is easy for her to hold, and lighter weight (but not less durable) than some other cases on the market. Impressive, huh? While I don’t plan on taking a baseball bat to the iPad, I do know that my daughter and grandson have been giving that case a huge workout, and it has done really well. I do recommend it for your electronic "investments"! Military Standards (meets or exceeds MIL-STD-810F)--Not sure what that means, but if the military can put it to the test and pass, then I know it will hold up to my wild children! Another great feature are the speaker access on the FRONT of the case, instead of the back. This allows us to lay the iPad flat and still be able to clearly hear the audio portions of the apps, movies, and games we're using. The only slight drawback I see is the corner silicone accent pieces were a bit too loose in their fitting, and my grandson would constantly fidget with them while he was playing games or watching videos on the iPad. While easily pushed back into place, I would love to see these fit just a little bit tighter to prevent kids from being able to mess with them. The Kraken A.M.S. case for iPad 2/3/4 retails for $69.95, and is appropriate for all ages. This case is compatible with Apple New iPad, Apple iPad2, Apple iPad3, and Apple iPad4. I want to mention that I did purchase the Kraken A.M.S. Tablet Stand to go with this case because the main thing we use our iPad2 for is watching movies, TV shows, and educational videos, so having the ability to "kickstand" it was something we really wanted. It was only $19.95, which I thought was extremely reasonable. It is a great addition to a solid, durable case, and is made to click perfectly into place on the Trident Case. Trident Case offers a ton of different cases for almost all electronic devices on the market right now, including Apple, Samsung, Kindle, and more. I encourage you to explore their site or some of their social media sites listed below to see all their offerings. Still not sure if one of these cases might work for your electronic devices? Maybe taking time to read a few more reviews of the various cases might help! Other members of the Schoolhouse Review Crew reviewed these products for the last six weeks as well, so click the banner below to read more!